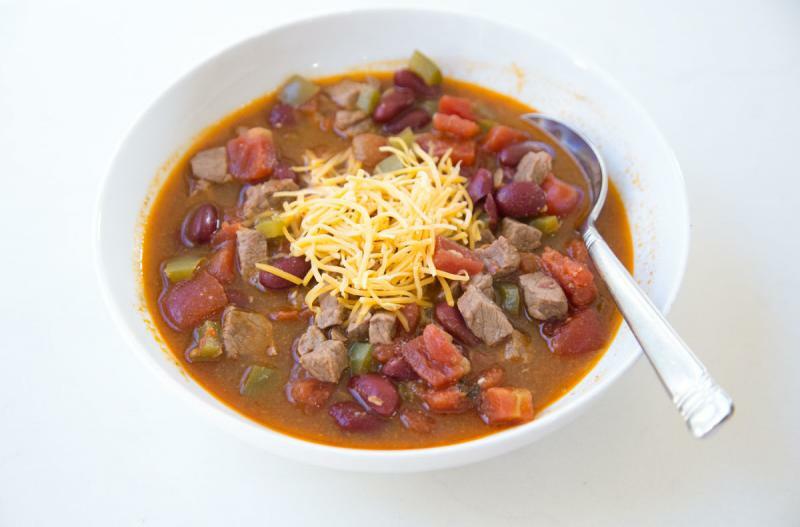 A hearty, chunky chili made with stew beef cubes, red kidney beans, and all the best spices for the perfect chili. Enjoy! Open and drain the can of diced tomatoes. Open, drain and rinse the red kidney beans. Seed and chop the green bell pepper. In a large saucepan, brown the stew beef cubes with the minced onion and garlic powder. Stir in the chopped bell pepper, diced tomatoes, red kidney beans, chili powder, ground cumin, and saute for 5 minutes. Stir in the beef broth and let simmer for 10 minutes to allow the flavors to mingle. Season with salt and pepper to taste. Ladle into bowls and garnish with a few pinches of shredded cheddar cheese. Serve Steak Chili with side salad. Seed and chop 2 green bell peppers. Open and drain 2 cans of diced tomatoes. Open, drain and rinse 2 cans of red kidney beans. Look for “beef for stew” cubes at your store. If you don’t find any, you can purchase a beef chuck roast and cut into 1-inch pieces. Recipe is dairy-free when the garnish is omitted. Thaw and add contents of baggie to large saucepan or Dutch oven. Bring to bubbling and cook for 20 minutes.